Will Europe toast GM wheat for gluten sufferers? Soon, individuals with celiac disease in southern Spain will begin receiving regular allotments of bread. Rather than misguided charity, this will be a clinical trial of a new type of dough made from genetically modified (GM) wheat. The wheat has been altered to be low in gliadins—the portion of gluten proteins that are toxic to people with celiac disease. If successful, the trial could bolster growing research efforts to engineer wheat to be compatible with the immune systems of the ~1% of the global population with celiac disease and the much larger number of people with gluten allergies. Low-gluten wheat could also open a new front in the battle for GM food acceptability in Europe. If Europeans are ever going to accept a GM food, celiac-safe wheat may be a good candidate. European consumers accounted for over 1.1 ($1.21) billion of nearly 1.9 billion worldwide gluten-free food market, according to market research firm Euromonitor International. Global gluten-free bakery sales are expected to grow at >7% annually, the firm predicts. But because this and other efforts to modify wheat involve inserting genetic elements to silence genes, they are subject to a European regulatory process closely tied to anti-GM politics. And even if such legal barriers to marketing are overcome, marketing such a wheat would require not just farmers, but millers, bakers and consumers to be persuaded that it is worthwhile. Wheat is used in a large variety of foods and even non-food products, thanks to the elastic, adhesive properties of its gluten proteins. These glutens trap air bubbles during dough fermentation, giving bread its elastic, chewy texture. Wheat’s ubiquity in foods makes it a major target for agricultural improvements of all kinds. As one of the big three grains, together with corn and rice, wheat is the leading provider of calories in the global diet and constituted 29% of global cereal production in 2015, according to the Food and Agriculture Organization of the United Nations. But as more and more foods incorporate this staple cereal, the incidence of celiac disease—a chronic, small-intestinal enteropathy triggered by gluten proteins from wheat (as well as barley and rye)—has been on the rise. Researchers at the Mayo Clinic in Rochester, Minnesota, found that the disorder is more than four times more prevalent today than it was a few generations ago1. The simplest way for people with celiac disease to avoid problems is to bypass wheat altogether; indeed, breads made from rice, corn and other grains are ever more common on supermarket shelves. However, in the absence of gluten, the texture, smell and taste of bread are not the same, necessitating the use of additives, enzymes and emulsifiers. Another approach to gluten intolerance is to improve people’s ability to process gluten through pharmaceuticals that break down gluten in the gut or by means of vaccines that increase tolerance to gluten antigens. Reduced-gluten flours can also be used to lower levels of gluten in bread dough before consumption. The approach that is furthest along is a non-GM approach, developed by Marco Gobbetti and colleagues at the University of Bari, Italy. Since 2002, they have pioneered the use of lactic acid and fungal enzymes from the baking industry to degrade gluten to fewer than 10 parts per million—below the European and American standard for gluten-free food (which is <20 parts per million). An industrial partner, Giuliani (Milan), started marketing a gluten-free wheat bread to the public last June. But what if wheat itself could be modified before it ever reached the mill and was made into flour? At least three groups in the US are attempting to use conventional breeding techniques to produce a celiac-safe wheat. However, this approach is confounded by the fact that the most widespread species of wheat, commonly called bread wheat, is hexaploid. Those six sets of chromosomes make it difficult to breed out the genes that produce the harmful gliadins. Further complicating this approach is the complexity of the gliadin locus itself. Three structural isotypes exist on two wheat chromosomes in complex loci. Altogether, hundreds of copies of gliadin-encoding genes exist in a typical wheat genome. This is why Francisco Barro, and his team at the Institute for Sustainable Agriculture (IAS) in Córdoba, Spain, has resorted to RNA interference (RNAi), a tool in use in his laboratory and elsewhere for improving crops. Barro and colleagues first got involved as part of the institutes broader research on wheat improvement. He was attempting to alter the nutritional content of gliadins in bread wheat for healthy consumers. While doing a literature review, he discovered the problems that gliadins posed for celiac patients and concluded that removing the gliadins altogether might be more useful. “It’s a coincidence I got into this,” he says. RNAi allowed Barro and his colleagues to target the gliadin-producing genes on all wheat chromosomes, deactivating the gliadin before it could combine with glutenin proteins and form a gluten. At first, they targeted only most toxic gliadins, but they found that the plant compensated by growing more of the remaining gliadins. They then developed a new set of vectors, containing a set of inverted repeats homologous to the most conserved portion of gliadin, with which they were able to silence dozens of genes2. Using this construct, their wheat lines contain on average only 7.8% the toxic gliadins of unmodified wheat, which in immune cells from celiac patients, provoked fewer inflammatory reactions ex vivo. In tandem with the research publications, the Barro group has also started producing a test bread3, filed patents and hired a British technology transfer firm—Norwich, UK–based Plant Bioscience Limited (PBL)—to find partners to commercialize the seed. Members of the celiac community have also been cheering him and his team along. Córdoba resident Emilio Naranjo Trenado, secretary of the Federation of Associations of Celiacs of Spain (FACE), recalls that Barro’s work began appearing in local media after the team published their first scientific papers on the low-gliadin wheat. Naranjo got in touch with Barro and began asking questions about the wheat’s performance and the likelihood of its commercialization. That and other contacts with the celiac community helped motivate Barro and his team to make a test batch of bread from their wheat, Barro says. In 2013, the team asked a panel of 11 trained tasters to rate the experimental bread and two types of control breads: a bread made from unmodified wheat, and a gluten-free bread made from rice flour. 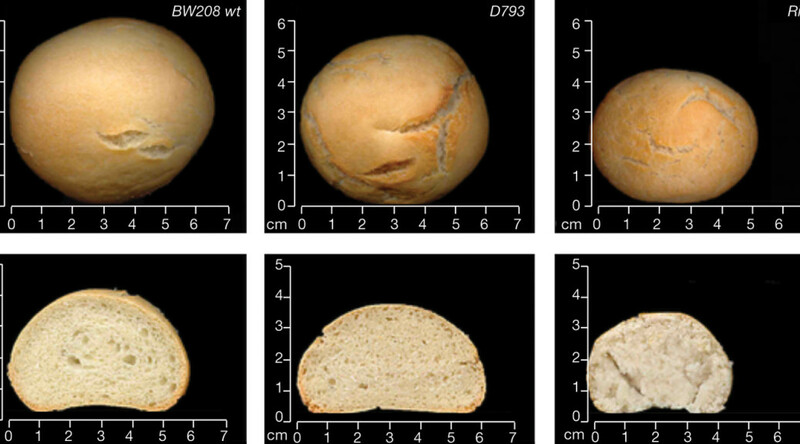 The GM wheat bread was 20–30% less voluminous than its wheat counterpart but it retained some of wheat’s other properties, such as a satisfying crust and longer shelf life than rice- or maize-based products. The taste testers gave it average scores of 6.6 out of 9, compared with 7.4 for unmodified bread and 2.4 for the rice bread. By the time of the 2013 bread test, Jan Chojecki, managing director of PBL, was already talking with Barro, a regular collaborator with Spain’s national research council, “I thought this was a really, really good example of a consumer-facing product from agricultural research,” says Chojecki. “We very rarely see something that has consumer appeal. [Most research efforts] usually focus on drought tolerance or pest resistance.” Barro and his colleagues prepared patents and the IAS licensed them to PBL. PBL, which is co-owned by the UK’s biological research council, the John Innes Centre and the Sainsbury Laboratory, makes investments in academic intellectual property, and helps transfer the technology into industry. If you bake it, will they come? There are many reasons why Europe is an unlikely place for GM wheat to take root. European consumers have resisted widespread adoption of GM foods so far. Many national governments continue to insist on opt-out clauses for European Union (EU)-approved GM cultivars and imports. As a result, despite the EU approving dozens of traits for food and feed and importation and processing, only one approved crop is currently cultivated inside the EU. Many of the GM crops Europe does grow and import are used to feed farm animals instead of directly feeding humans. Some biotech companies based in Europe have simply decided to uproot operations and move to the US. Spain, however, has taken a more GM-friendly stance; it is the site of ~90% of the GM crops grown in in the EU, mostly Monsanto’s (St. Louis) MON810 insect-resistant corn expressing the Cry1Ab Bacillus thuringiensis gene. Importantly for Barro’s GM wheat, some Spanish celiac organizations have already expressed a willingness to accept GM origins if it means their members can eat wheat bread. If bread made with the experimental wheat passes European approval for sale as a food, says biologist Juan Ignacio Serrano-Vela, manager for research and education at the Madrid Association of Celiacs and the Gluten-Sensitive, the GM aspects do not trouble him. “If it passes all the rules, I’m fine [with it], and I’d tell that to other members,” he says. Yet Pastor persisted, designing a recipe that involved overnight fermentation and practically soaking the dough in water. Unlike conventional recipes that call for continual kneading or stirring of dough, his recipe interfered as little as possible with the gluten, which thanks to its reduced gliadin, was probably more delicate. It took many tries and fine-tuning, but in the end he achieved a bread that rises on its own, without additives. Pastor calls the smell and flavor a pleasant surprise. Yet for Pastor to be able to share his creation with his celiac wife, and for other millers and bakers everywhere to bake gluten-free wheat products, there is just as much logistical work to be done as scientific. “I’m sure you can make a loaf of bread,” says Shewry, “but how amenable is it to high-throughput methods?” Shewry, author of a recent review of wheat-improvement research4, notes that the lack of gliadins affects not just the final product, but also the way flour and dough can be processed along the way. “Wheat gluten affects processing quality,” he says. A less resistant and stretchable dough may require different machinery or recipes, as Pastor has already discovered. How that will translate into production costs is unknown, but Chojecki says that because gluten-intolerant consumers must already pay anywhere from double to six times the price of comparable products, any producer will have plenty of room to maneuver. Even if the existing production systems could make gluten-free breads, in practice, celiac suppliers require separate supply chains to avoid contamination from non-GM wheat. It is all too easy to cross the 20 parts per million threshold used by the US and EU, as occurred at a General Mills facility in 2015, forcing an expensive recall of several types of breakfast cereal. For GM wheat, consumers in some markets may also demand separate facilities to prevent contamination in the reverse direction. People who resist GM products also fear contamination in the field, not just in the production line. US farmers once voiced their opinion against developing what they feared might be an unexportable product5. Their fears proved true in 2013 when Japan and South Korea banned imports of US wheat after researchers found an escaped GM strain in Oregon fields. It took over a year for the US Department of Agriculture (USDA) to announce that the Oregon case was an isolated event. Another fundamental challenge for commercializing any GM wheat is written into the plant’s biology. Wheat is self-germinating, so farmers may be able to retain some seeds for planting future crops, sidestepping the license holder. Chojecki’s solution is to suggest that a gluten-free wheat be grown under contract, to remove the incentive for farmers to save seed. A specialized miller or baker would pay both the licensing fees and for separate cultivation and delivery to their facilities. In an independent vote of confidence in the future of low-gliadin crops, consortia from the Commonwealth Scientific and Industrial Research Organisation (CSIRO) in Australia and New Zealand to the USDA are researching modifications using genetic, genomic and molecular methods. They are also researching methods for reducing gliadin in other crops, such as barley6. Among those methods is genome editing with CRISPR or other targeting nucleases, which may prove to be a “cleaner” way of achieving the same result, says Shewry, because it does not require the insertion of external vectors into the plant. It will also benefit from the growing international effort to sequence wheat’s complicated and varied genomes. Yet genome editing is still subject to regulatory uncertainty7. Once Barro’s wheat is in the hands of millers and bakers and stores, somebody will need to explain what it is to customers. The wheat is not gluten-free. It contains gluten proteins that lack many of the gliadins that form part of normal gluten. It is less toxic than normal gluten, Barro’s 2010 ex vivo study suggests, but its human trials will reveal its short-term effects. “The bread could be suitable for gluten sensitivity and not for the celiac disease because of the remaining gluten,” says Gobbetti, the researcher behind the sourdough-modified wheat bread. Even if celiac people turn out to tolerate a slice or two of bread per day in the planned three-month trial in Córdoba, this first trial is not designed to reveal their long-term tolerance. Gobbetti’s human testing dates to 2010 but the commercial product has only been on the market since mid-2015, so long-term data from real-world usage are still unavailable. “In my opinion, long[-duration] challenges are needed,” Gobbetti says. That is because the inflammatory reactions of celiac disease cause cumulative damage to the intestine, in addition to short-term trauma. Barro’s trials will look for signs of inflammation, but he says that anyone wanting to commercialize the low-gliadin wheat should do longer-term studies at multiple sites to gain a better understanding of the long-term effects. It is also a complex commercial proposition. Chojecki’s prospective commercial partners, the leading contenders of which are North American, must be prepared to shepherd this or an updated low-gliadin wheat through deregulation in its home jurisdiction. Then they would have to obtain approval for importation to the EU before seeking intermediate milling partners willing to establish separate facilities. Finally, the millers will need distribution partners. And instead of selling their product as gluten-free they will need to establish, through the ongoing clinical trials, some sort of ‘celiac-safe’ criteria based on gliadin content. “I don’t know if there’s any player with the capability and resources in Spain to do this,” Chojecki says. This is frustrating to the Spanish team that has put so much sweat and tears into the process of developing this GM product. “From our point of view, it would be frustrating if in the end it’s not commercialized here,” Barro says. También publicado en Scientific American en Español: [html] [pdf].